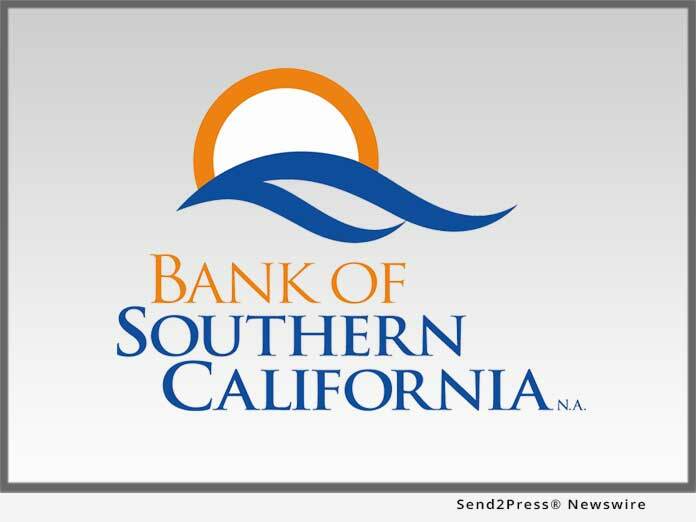 LOS ANGELES, Calif., Dec 03, 2018 (SEND2PRESS NEWSWIRE) -- Bank of Southern California, N.A. (OTC Pink: BCAL), a community business bank headquartered in San Diego, Calif., is pleased to announce its continued expansion in Los Angeles with the opening of a new production office in West Los Angeles. The office, located at 11150 Santa Monica Blvd., Suite 890, will be Bank of Southern California's fifth location in the County, further demonstrating its commitment to the vibrant Los Angeles business community. "The opening of this production office further expands our network and presence in the region, providing us with the opportunity to meet the growing demand of businesses throughout Los Angeles County," said Nathan Rogge, President and CEO of Bank of Southern California. "The West Los Angeles market is attractive, not only because of its proximity to the Bank's existing footprint, but also because of the number of thriving and prosperous businesses in the region left unserved by larger banks," Rogge added. "The company's strategic vision is to become a leading community business bank serving the Southern California region, and grow into the Bank's name as it implies," said Rogge. "Bank of Southern California has grown significantly in recent years through a combination of organic growth and acquisition, and we are continuing to pursue new market growth opportunities in 2019." "Our clients recognize the value of our relationship-based, solutions-driven approach, which combines the sophisticated financial expertise and tools of a large bank with the genuine, personalized service and local engagement of a community bank. We are pleased that we can now better serve Orange County businesses," concluded Rogge.